Abu Dhabi, Jan 16, 2014: Dr Shamsheer Vayalil Parambath, founder and managing director of UAE headquartered LLH Healthcare Group which operates hospitals and clinics across the GCC, has been conferred with the Pravasi Bharatiya Samman Award 2014 for his valuable contribution to the overseas Indian community in the Middle East. The award is the most prestigious and highest honour accorded to non-resident Indians (NRIs). Dr. Shamsheer Vayalil, who hails from Kerala, has been running the LLH Healthcare Group in the Middle East for the last six years and has already been recognised for his contribution and commitment to the health care sector and humanitarian aid activities in the Middle East. The Pravasi Bhartiya Samman Award is the latest award for his contribution to the humanitarian cause. 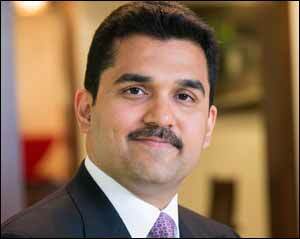 Dr Shamsheer Vayalil is one of the youngest Indians to have received the Pravasi Bharatiya Samman Award. Pravasi Bharatiya Divas is celebrated on 9th January every year to mark the contribution of the overseas Indian community to the development of India. During the event, individuals of exceptional merit or individuals who have worked to enhance perceptions of India are honoured with the estimable Pravasi Bharatiya Samman Award as recognition of their role in India's growth. Dr Shamsheer was born in Kerala and completed his degree in Medicine and Bachelor in Surgery (MBBS) and Doctor of Medicine (MD) from Mangalore and Chennai, respectively. In a short span of seven years, he has established a truly integrated, end-to-end healthcare organization, delivering quality healthcare that caters to the needs of the community in the Middle East region. The LLH Hospital Group began its operations in May 2007 with the opening of the LLH Hospital in Electra Street in the centre of Abu Dhabi. Today, the LLH Group has developed into a sophisticated and integrated healthcare provider with a portfolio including - the largest private tertiary Hospital in the region LLH Hospital Electra-Abu Dhabi; LLH Hospital Mussafah-Abu Dhabi; Life Care Hospital Al Raha-Abu Dhabi; Lakeshore Hospital � India; LLH Hospital Sohar-Oman; LLH Hospital Salalah-Oman; Burjeel Hospital for Advanced Surgery � Dubai; more than 30 onsite clinics across Abu Dhabi; and, LLH Event Medical Service across the UAE, Oman and India. Dr Shamsheer founded and heads more than 10 organizations including organisations providing care for over 250,000 workers, a pharmaceutical manufacturing plant and a pharmacy retail chain. Simultaneously, he has been actively involved in the humanitarian cause and social projects that have benefited various communities across the Middle East, India and North Africa. He is also planning to embark upon a new journey by opening a chain of hospitals in India to serve the nation's community with quality healthcare and wellness services. Dr Shamsheer has been credited with launching the first seven-star Hospital in the Gulf region - Burjeel Hospital, Abu Dhabi. Burjeel Hospital lays special emphasis on reviving the lost art of healing along with the best and the most advanced facilities and techniques in treatment, equipment and diagnosis, and with a team of renowned specialists and medical personnel at the helm. Dr Shamsheer has also been recognized by the UAE government, Indian government, industry and trade associations as well as media. He has also been awarded the Hamdan Bin Zayed Award for Humanitarian Aid 2013; Arab Health International Leadership Award in 2012; the Ernst & Young Entrepreneur of the Year in 2011 in the UAE; and Sheikh Khalifa Excellence Award in 2009; among others. He was also included in the 100 Most Powerful Indians in the Gulf by Arabian Business Magazine in 2012 and ranked among the 100 most powerful Indians by Forbes Middle East magazine. Previous Story : UAE's 1st Free Discount & Entertainment Portal is here! Next Story : Modoo Marble New Year Patch is Released!